West Windsor, N.J. - Exploring relationships, dealing with loss, and observing nature are all themes that jump off the pages of the 2012 edition of Kelsey Review, an arts journal published annually by Mercer County Community College (MCCC) and now available free at public libraries throughout Mercer County. Now in its 31st year, the 2012 Review features 26 works of fiction, non-fiction and poetry by 16 writers who live, work or study in Mercer County. Illustrations include cover art and other drawings by Holly Harrison Johnson and a drawing by Stephanie Cuddahy. According to Kelsey Review Editor Ed Carmien, an MCCC English professor, “Kelsey Review enters its third decade with a yen for change.” He notes that he and his co-editors strongly believe the journal’s best format is the printed page, but with more readers turning to electronic devices, Kelsey Review will be posted to the college’s website by the end of October as an interactive pdf file that will enable readers to download it onto their computers and view via mobile devices that include phones and tablets. In addition to Dr. Carmien, the editorial team includes fiction editor Roberta Clipper, an English professor at Rider University, novelist, poet and short story writer; poetry editors Luray Gross, author of three collections of poetry and a recipient of a Fellowship in Poetry from the NJ State Council on the Arts, and Ellen Jacko, an English teacher at Allentown High School; and art editor Edyta Kuciapa, a graphic designer and photographer at MCCC . Writing contributors include Vida Chu, Lisa Cugasi, Beverly Mach Geller, Elaine M. Gutterman, Lois Marie Harrod, Jean Hollander, Ken Jaworowski, Gwen Jones, Lavinia Kumar, Robert McHugh, Carolina Morales, Dan O’Brien, Wanda S. Praisner, Steve Smith and Alan Teplitsky. 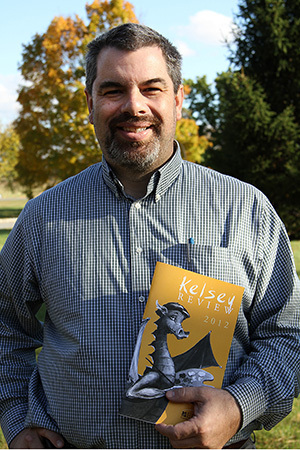 MCCC English Professor Ed Carmien is the editor of Kelsey Review. Carmien invites county residents to pick up their copies soon. “Read and enjoy the works in these pages. They may be the creations of your colleagues, friends, and acquaintances.” Copies of the Review are also available in public areas of MCCC’s West Windsor and James Kerney campuses. Kelsey Review welcomes new friends on its Facebook page. The editors invite the community to “like” the page and add their comments about the material in the journal and the arts in general. Those interested in submitting items for future editions will find the latest news, criteria and deadlines there. Funding for Kelsey Review has been made possible in part by the Mercer County Cultural and Heritage Commission through funding from the Mercer County Board of Chosen Freeholders, and the New Jersey State Council for the Arts/Department of State, a partner agency of the National Endowment of the Arts. The deadline for submissions for the 2013 edition is May 15, 2013. For more information, email Kelsey.review@mccc.edu or visit the Kelsey Review webpage here.